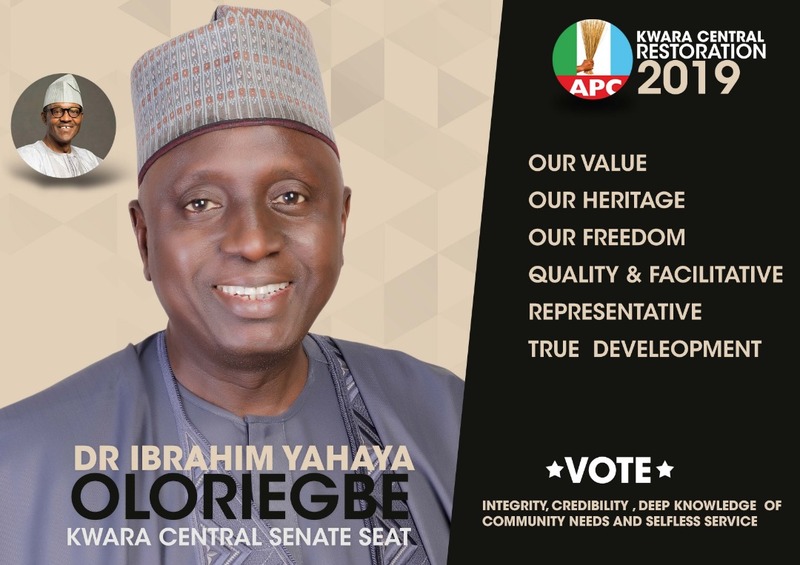 I have just received a call from the venue of our Primary Polls confirming my election as the Kwara Central Senatorial Candidate of the All Progressives Congress (APC) ahead of 2019 General Elections. I give glory to Almighty Allah for churning out this victory to our side. Besides, I congratulate all my co aspirants for putting up a very, very hard-fought campaign. We indeed owe them a major debt of gratitude for their willingness and show of maturity to render selfless services to our constituency and her people. I congratulate our great party, the APC for the smooth conduct of the elections and give kudos to all the members of the National Central Committee for doing a yeoman’s job in this respect. Much appreciation is accorded members of our state’s executive, down the pecking order of the party hierarchy. We salute the courage of all the delegates and we declare them the Heroes and heroines of the recorded success. Now is the time for us all in this constituency to bind the wounds of division and get together as a people of great vision and unblemished candour. To all the APC leaders both local and national, I say it is time for us to come together as one united people. I therefore pledge to every members of Kwara Central Senatorial District my core mandate that I will be Senator for all if given the opportunity to serve them at the Red Chambers. For those who have chosen not to support me in the past, of which there were a few people, I am reaching out to you for your guidance and your help so that we can work together and collectively salvage our people from age long deprivation and avoidable servitude. Our call for support should not be viewed as a campaign, but rather be seen as an incredible and great movement made up of thousands of hard-working men and women, who love their constituency and want a better, brighter future for themselves and for their families. It is a movement comprised of the aborigines and non natives but who are domiciled here. These great people are from all races, religions, backgrounds and beliefs but who are desirous of better future for the constituency. Working together will assist us all to upstage those milking our collective commonwealth and put us on the great path of beginning the urgent task of rebuilding our electoral block and renew the Kwara Central dream. I’ve spent my entire life and career looking at the untapped potential in projects and in people in many parts of the world. That is now what I want to do for our constituency if given a chance to serve them. It is going to be a beautiful thing because every single members of the constituency will have the opportunity to realise his or her fullest potential. The forgotten men and women of our political zone will be consciously remembered for an egalitarian society. We are going to fix our metropolis and rebuild our highways, bridges, neighbourhoods, schools and hospitals. We’re going to rebuild our moribund infrastructure, and make it by the way, second to none constituency in Kwara state. We will in the process put thousands of our people to work as we rebuild it. We will also take care of our aged ones. Our aged ones are incredible people. We will embark upon a project that will alleviate their poverty without necessarily traumatising them. Besides, We have a great economic plan in stock for everybody especially our teeming youths. No dream is too big and no challenge is too great. There is nothing we want for our future that is beyond our reach. Kwara Central will no longer settle for anything less than the best. We must reclaim our stolen destiny. We will seek common ground, not hostility. Partnership, not conflict. I love this constituency and I will give my very best to its socio-political and economic growth. Collectively we can rescue our today for a brighter future for our children. We count on you all for the overall victory at the D-day.